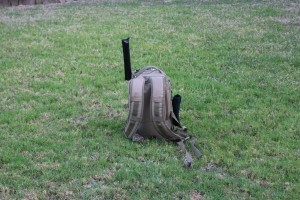 This is what I use for my ARES and emergency communication drills as well as for portable work (hiking or backpacking). As you can see it’s a simple backpack that you can find in many sport goods store (for example Big 5). I found that this backpack is perfectly meets my requirements. So what is inside? It’s simple set-up that allows me to work on HF and have everything that I need. Of course it also have an other supplies that you will need for emergency situation or hiking. – IC-703+ (10 Watts with antenna tuner). The great transceiver for portable use. High reliability, ability to work with many antennas, easy to use. – 12 V 10A battery. I use a regular 12 V, 10A battery which cost around $15. The better solution would be a Poly-MH batteries. Light weight and high current. – solar panel + charger. Well this is very useful. Can be used for your battery or ether for your cellphone or other equipment. – 5 m antenna pole (fishing rod). Found on eBay. Very cheap and fiberglass. The great mast for your portable antennas. – Inverted V 14 MHz/28 MHz antenna (transformer). This is the ultra light and portable antenna-transformer. In my version is 2-band Inverted V antenna. – extras (GPS, flashlight, rope and etc). This is really up to you. 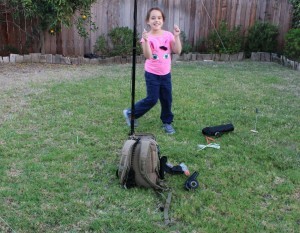 The total weight of this set-up about 18 pounds which is not bad at all. I personally prefer have some snacks and small emergency(survival) kit, medicines and water. Performance are good, not great but definitely enough to provide a communication in case of emergency and operate from any places with. Time to set everything up and get ready is very short and it’s about less than 10 minutes. Of course it’s not a perfect set-up and other people would prefer have something else but the main idea was – use everything that you can find in your home (garage), low cost and efficient work. I have done this many times and when you live in California you never know when the earthquake or different disaster will strike this land. You have to be prepared all the time and personal safety is always first. I’m a CERT (Community Emergency Respond Team) member, Police Department & Fire Authorities Volunteer, member of ARES so my responsibilities are expended. Всем привет. Вот так выглядет мое портативное рабочее место, очень удобно для походов, транпортировки и хранения. Все умещается в одной сумке и удобно в эксплуатации, не нужно ничего доставать или раскладывать, можно даже работать в эфире во время передвижения. Думаю все будет понятно из видео и фото. 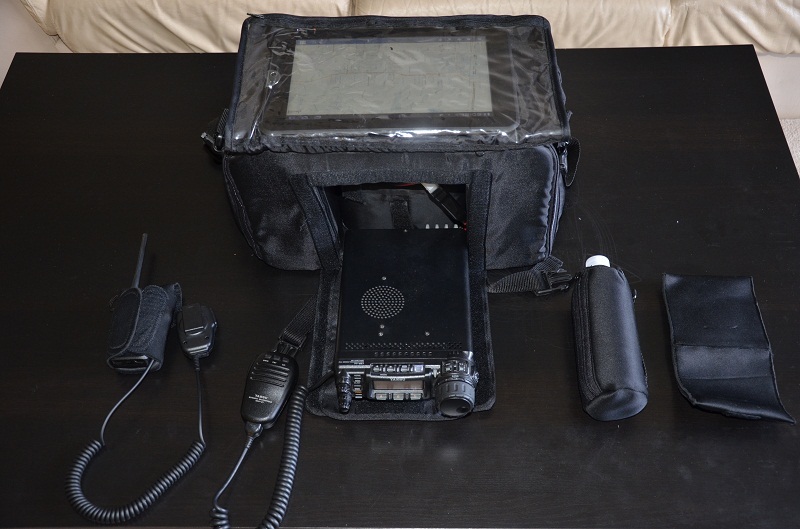 GO-BAG for YAESU radios. Grab and GO! Check my portable bag for Yaesu radios (FT-817, FT-857). Bag has three main sections. On the right section for an antenna analyzer or antenna tuner (has a waterproof case). On the left side you can store cables, headsets, headphones, interfaces, etc. The central part of the bag has two sections. One for the transceiver and second for a battery. Also, the bag has several pockets where you can store documents, instructions and manual. The cover has several pockets and they are all waterproof. The upper pocket can be used for a netbook or ipad. Bag can be used as a backpack, this is an additional straps.